A campaign to save the legendary nuclear-powered icebreaker Arktika, the first surface ship to reach the North Pole, has started in Russia. Activists call for the decommissioned vessel to be made into a museum ship. ­The ship’s two 171 MW reactors were stalled and dismantled four years ago, ending its 34 years of service. 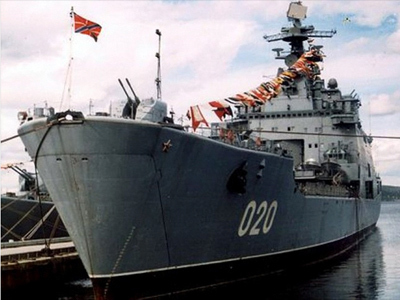 This July, Arktika was deleted from the Russian register of ships and is now slated to be scrapped. ­But some people, many of them professional arctic seamen, say this fate is not worthy of the icebreaker’s turbulent and heroic history. They want to find funding to make her into a museum ship. The Arktika’s past is full of records broken since her commission in 1975. She was the world’s second nuclear-powered icebreaker and a lead vessel of the class, which still remains the backbone of Russia’s icebreaker fleet. The 148-meter, 23,500-tonne icebreaker was designed primarily for civilian use, but in wartime it could be retrofitted to serve as a coastal defense cruiser. The potential conversion would include arming it with artillery guns and installing extra radar station. ­Worthiness for both civilian and military purposes had to be tested before she went into service. The ship was badly wanted in the sea, so the commission in charge decided to do all tests – including practice shooting – in one session. About 700 people, some of them leading specialists in respective areas, crammed into the Arktika’s 125 cabins. Ironically they waited for four days, because the water level in the Neva River’s mouth in then-Leningrad (now St. Petersburg) fell too low for the giant ship. After the Arktika proved powerful enough to break ice sheets as thick as five meters, she was sent to the most ambitious destination – the North Pole. In August 1977, she carried over 200 crewmembers, scientists and technicians across the frigid Arctic waters to the northernmost point of the planet. The journey was considered quite dangerous. If ice lumps or stress damaged even one of the Arktika’s propellers badly enough, she would lose enough power to get stranded in the ice. Surveying the area for best routes was a challenging task for the pilots of the helicopter the icebreaker had on board. In the worst moments the ship had to traverse ice sheets so thick, that she had to constantly pull back on push forward to break them. ­Nevertheless, on August 17 the Arktika reached her destination, and the crew set a flag mast to raise the Soviet Hammer and Sickle flag. The official ceremony was preceded by jubilant circling around this literal pole, as explorers joked that they were walking around the world. ­On that day the ship master faced an unexpected shortage of supplies. One of the technicians made an improvised rubber-stamp postmark saying “North Pole. Nuclear Icebreaker Arktika”, and the number of people wishing to “send a letter” from this address quickly exceeded the reserve of postal envelopes aboard. The improvised postmark indicates the North Pole as the letter’s return address. 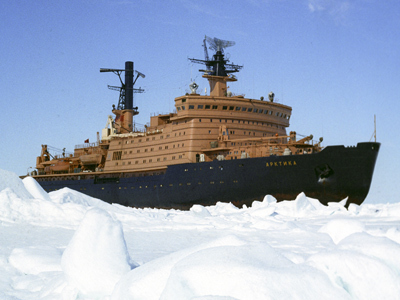 In 1982, the icebreaker was rechristened after late Soviet leader Leonid Brezhnev. The name, however, didn’t stick, and the ship became Arktika again just four years later. There are two theories about the flip-flop. ­The more official claims that the renaming resulted from a typo in the order on commemoration of Brezhnev. The plan was to name after him another icebreaker, which was almost complete by the time and was later christened Rossiya. The authorities would not admit the hilarious error for years. ­But as Brezhnev, the icebreaker endured one of its toughest seasons. In 1983, weather played a dirty trick with the seamen navigating the Northern Sea Route. A sudden cold snap and northern winds trapped some 57 vessels in eastern Arctic. 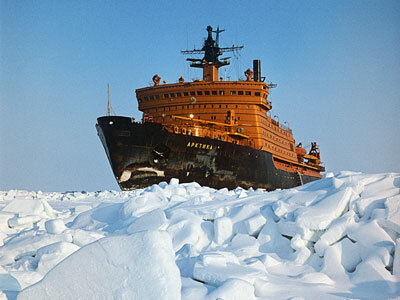 One ship was crushed by the ice, and even icebreaker Lenin became stranded. Arktika/Brezhnev was essential in the long rescue operation, one of the largest or its kind in history. M/V Nina Sagaidak was destroyed by ice during severe weather in 1983. Luckily, the crew escaped safely with no casualties. ­The icebreaker was also involved in several pick-up missions for scientific ice-drifting polar expeditions. It made a record year-long autonomous voyage in the Arctic between 1999 and 2000. By 2005 its total mileage broke the 1 million threshold. Petitioners say Arktika’s historical significance is more than great enough to preserve her for future generations. After all, her precursor Lenin was re-made into a museum. Arktika’s conquer of the North Pole is no less important than Gagarin’s first flight into space, they say. Their site says the goal is to obtain 100,000 signatures – enough to make the Russian government officially consider the initiative. “We need solid proof that people are interested in her. And they are. We’re getting new signatures at a good pace,” Igor Nikulenkov, the instigator of the petition, told the Russian TV channel NTV. ­So far some 6,500 people have backed the petition, but organizers hope more will come as the word about Arktika’s perils spreads. The ship has been stripped of some of its equipment, including the nuclear reactors, but most of the instruments remain intact, which would slash down the cost of possible conversion. “When I was leaving the icebreaker in 2009, I told her my goodbyes. I couldn’t stand to see her as she is now,” Aleksandr Barinov, the last captain of the icebreaker, who is now director of the icebreaker Lenin museum ship. 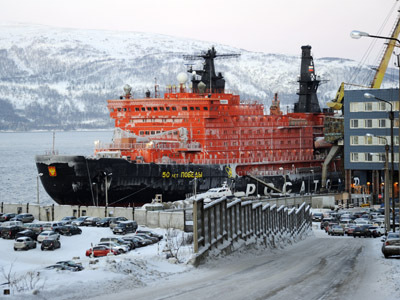 ­Activists want the icebreaker either moored permanently in her home port Murmansk or transported to the place it was constructed, St. Petersburg. The latter is costlier, but would generate more revenue in the long run since the city is already a popular tourist destination and the Arktika would not compete with the Lenin there. If the icebreaker is to be saved from scrapping, it had better be done soon. She is safe until at least 2015, but after that it may be too late.